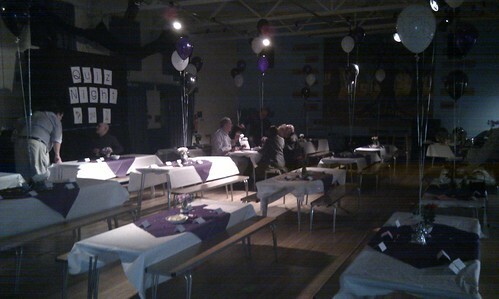 The school hall, being prepared for an influx of parents. Last Friday evening came the culmination of weeks of work for Hayley and a good few hours of my own time. It was the quiz night at Oliver’s school. Hayley and two other Mum’s had spent weeks assembling, reviewing and rehearsing questions in readiness for this evening. 3) Don’t drink the profits. The provision of the music round included 10 questions based on samples of music: intros, 1-second snippets, and songs played backwards. Not to mention suitable clips incorporating both the original sample and one to reveal the answer. So all in all I spent a good few hours slaving over a hot audio editor. (The fact it was great fun is to be overlooked at this point, I’m going for the martyred look here.) But all that was in place well before the day. The bar was a different story. I don’t know why I had reduced this job in my mind to handing over the odd bottle of beer in a relaxed fashion. Oh hang on, yes I do, that’s how Hayley sold it to me. In fact even a momentary assessment of the number of tickets sold coupled with my distant but lengthy experience working behind a bar would have told me that this was no small endeavour. On the afternoon of the quiz i went to set up the bar while the ladies set up the tables, chairs and decorations. It only took me about 2 solid hours. When the doors opened later that evening my bar was greeted with an onslaught. It was all hands to the pumps (metaphorically, given there was no draught beer) and in no time we found ourselves with hardly any change and members of our crew having to make dashes to the supermarket to buy more beer. Once the storm was weathered, I had the pleasure of DJ’ing the music round while Hayley read out the questions. It was great to see people racking their brains to remember the names of songs and trying to mentally race through to the chorus from the intro I had played. At one point an entire table even spontaneously burst into song when they got a lyrics question right. Classic. By the end of the evening we had raised a rather splendid £1400 for the school and had a great time into the bargain. Who knows, maybe they’ll let us do it again one day, even though the somewhat disgruntled teachers’ team only came second!